(Accommodation Facility Module, Travel Module and Event Module), allows online booking of content on the Form. For example, activating the Booking Form and the Facility Form allows you to book your stays Accomodations (hotels, B&B, residences, villages, etc ...). The Search Engine of the Booking allows the insertion of IN and OUT dates and the number of people (adults / children / infants) for booking. After viewing the cost of the stay and its discounts and extras, the navigator can proceed to online booking and payment. 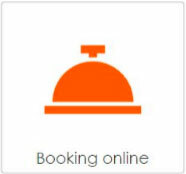 Booking also allows you to request availability or receive a quote without having to make an online reservation. Go to the website and click on the CMS button on the left panel. In order for the Booking Module to work, you must have previously entered the accommodation facilities. Now, click the BOOKING button on the CMS Home page (Dashboard). Alternatively you can access the Booking from the management of the accommodation facilities by clicking on the Booking Online button present on each Accommodation. Login to the list of accommodations for the management of the Booking. Next to the name of the Structure you will see a push-button with all the main features of the Booking. Click the OPTIONS button to immediately access the Booking options. Before entering prices, creating rooms, entering periods or other, you must set up your booking method and the Search engine for the specific accommodation facility. Each facility may require different calculation settings and different search types. You can choose from 5 different types of calculation , click on the icon to enable the calculation type. Booking can calculate the rates charged per day per person, per week per person, per period per person. In this type you can also enter the automatic discount calculated according to the number of adults, children and infants, depending on their age and bed. Get Rate per day per room / apartment. Calculation of tariffs for the period and per room / apartment. Get Rate per package / offer. Calculation of tariffs for beds. You have to define the type of calculation you need to set the search engine (of the single accommodation). You can activate the adult / children or people field, enable the infant, deactivate the checkout field and, very importantly, define the type of reservation. The search engine displays all check-in and check-out calendars. Indicates which days of the week will appear on the check-in and checkout calendar. Indicates the minimum length of stay. You can also enable / disable the days of the week for checkin and checkout. It indicates the checkin and checkout with specific dates in the calendar. Use columns to change the discount rate, save to apply the changes. In the Booking management options, click the button of payment. Select a payment method from those on the website or add / customize one new type of specific payment for the selected Structure. If it is not what you need contact our staff. After defining the type of calculation of the Booking, the type of search engine and the payment methods, passes to the insertion of the rooms. After insertion of the rooms you can create periods and then the price. (eg standard room > double bed type> persons 2). After creating the standard room, as in the example, you can add more typologies (double, single, triple etc.). The amount (availability) refers to the chamber and not to the types. If you need to enter different availability for typologies (eg 5 matr., 3 triple, 6 singles etc ...) you will need to create more rooms. For every room you enter a type. Click the INSERT button to complete the room insertion. To enter other types, go to the rooms and click on the INSERT TYPE of the room specification. Click NEW PERIOD, choose the room to which the period refers, enter the dates, name of the period and room availability. Click the enter button to move on. Proceed with the inclusion of periods and availability for each room / apartment. After the creation of the Periods you can proceed with the insertion of the Prices. Set the Price for each Type for all Periods based on the type of calculation previously entered in the Booking Management Options. Click the Save button to complete the insertion. When the Periods, Availability and Prices are entered, it is active. You can complete the data entry by indicating discounts, extras, fixed prices, you can enter releases and availability locks, modify form fields for reservations. With the Fixed Rates option you can enter extra services for your stay, such as transfers, flights, restaurants, etc ... with prices, availability, photos and description text. With the Discounts option you can enter discounts for your stay like Book One, Long Stay, personalized discounts, fixed, in percentage, allocated to rooms specifications and range of dates. With the Extra option you can enter extra stay costs (club membership card, insurance, supplements, extra services etc ...) assign them to the accommodation or specific rooms, payable locally or to be included in the total stay. With this option you can enter the availability block for specific rooms and the release with fixed date or number of days before arrival. With Calendar you can quickly view availability and prices of rooms, bookings and log in to the planner. You can customize the booking form by adding fields according to your needs. and set the paid / unpaid payment. You can print the reservation, edit it, enter notes, send an email to the customer, create the invoice and create a voucher.